As you well know, 2013 is conventionally considered the 50th of videoart. Was in 1963 that Nam June Paik expose his first videoinstallation, in Germany. To celebrate this event, Magmart Festival launch a new project: 100x100=900. 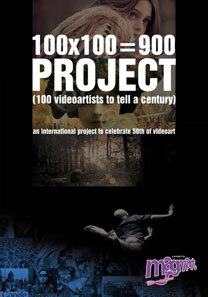 100 videoartists are be called to be part of project, realizing a video around one year of past century. The artists are selected within the winners of previous editions of Magmart Festival, to assure the gross quality of project. The selection is done with the goal of include artists by five continents. All these videos, will found a relevant corpus, a remarkable narration of this dense present perfect. The project will start its exhibition stage in 2013, with a screening in Naples (Italy) in the course of Universal Forum of Cultures. After, we want take the project around the world, the must widely possible. We are looking for partners, to bring the project around the world. At partner, we ask to organize at least one full screening of the 100 videos, in their country. The look of any event must match the general guidelines of project. The name of partener organization will be listed as partner of project, au pair like all others, and the logos will be showed every where the project will arrive. Any partner is free to find local sponsors for the project, and keep the contribution for the organization of local event; local sponsors will be listed and showed worldwide. When the partners list will be closed, we’ll contact single curator to organize show in uncovered countries and – in case – in the same country of a partner but on different locations (always with the agreement of partner). If you like to contribute at the project, we are at yours disposal to provide more exhaustive and/or detailed informations. Photon Gallery was established in 2003 in Ljubljana in order to present and promote the artists from the Central and especially Southeast Europe, who are in particular engaged in the field of contemporary art photography. A special attention is paid to the international activity of the Photon Gallery. Therefore we’ve established program collaboration with some of European photo galleries, organizations and festivals; we also increasingly participate at international art fairs. In terms of international activity, special mention should be made of the establishment of our own Photo Festival (first edition in 2005). In last three editions, Festival Photonic Moments – Month of Photography encompassed a yearly average of 30 exhibitions as well as related events, such as symposium entitled Discussions on Contemporary Photography etc. We also grant the »Photo Exhibition of the Year« award. In 2006 we’ve introduced an additional program, consisting of presentation of contemporary video art. Video in progress presents a main video program, which has been organized in the collaboration with the Kolektiva group since 2006. Video will remain strong in the program of Photon Gallery, even more – in near future we will launch a special venue, intended for broader engaging with video art.